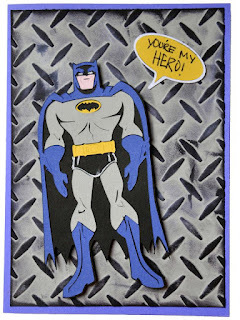 I made this card using the Batman: the Brave and the Bold cartridge. I used a blue card base.. added the diamond plate embossed layer (using my cuttlebug to make this embossing and then inking the gray cardstock with black ink), and batman on top with some pop dots. I also cut the talk bubble from the Batman cart and the inside has some bats also cut from the Batman cart.. I hand wrote my sentiment on the front "You're my hero!" I just love your BatmN card. And I know that Brandon will love it too. Great card! I love all of the details. Jamie love the sentiment and the Batman. You selected the perfect embossing background for this one. I am sure Brandon will love it. Every boy wants to be a super hero. this is just the perfect boy card that I am sure Brandon will love. I love the background and batman really stands out, looks fantastic. CWC Blogaversary Day 6 - You're A Star!